Dropcam – This webcam features digital pan and title, 2 way audio, and night vision. This one is available on Amazon for $182.94. Motorola Pet Scout66 – The webcam features 2 way audio and night vision. This one is offered on Amazon for $99.99. Setup of the system is simple. But I am somewhat technical, and not afraid to poke around software menus. However, if you don’t feel comfortable installing and setting this up, I’d suggest contacting your technical friend to assist with your setup. Decide on the physical location for the setup. It will require a power outlet to plug in your laptop. You may also want a small tabletop to place your laptop. Plug the webcam into the laptop. Ensure that necessary drivers are installed. Most modern operating systems will automatically install the driver for you, but may require a few minutes for installation. Download YawCam from http://www.YawCam.com and install it on your laptop. Launch YawCam. Two small windows should load. One with the main YawCam window and another with the preview of your webcam output. If the preview window is all black and says “No Device Selected”, go back to the main window’s menu, ‘Settings > Device (none) > Change to > (select your WebCam)’. This webcam will now display the webcam’s main output. Finally, on the main window, click the ‘Enable’ button by ‘Stream’. The red hexagon will turn into a World icon. To get the web url of your streaming webcam, go the main window’s menu, ‘Setting > Edit Settings…’. On the next window, the vertical menu on the left, click the ‘Connection’ tab. On the new panel, click the ‘What’s my URL?’ button. This will launch a browser window with various links. You’ll want to use link next to ‘Stream’ under the heading ‘When you are online other people can see your webcam on these addresses’. So before you begin the setup, weigh the pros and cons of using this DIY wireless webcam vs purchasing a wireless webcam. So what’s the difference between using YawCam and buying a new wireless webcam? It may come down to how technical you are, or it may come down to how much you’re willing to spend. Setting up a new wireless camera is much more plug and play than YawCam. So your decision may hinge on how technically savvy you are. Buying a new webcam will cost you money. If you plan on using your webcam for a long time, it is worth purchasing a new wireless webcam, because the whole setup is packaged into a small device (no laptop required). The YawCam setup will not allow panning or tilting, but since my puppy is confined to his small area while home alone, this is not a very big issue. YawCam does not do night vision, but that might only be because the webcam does not support it. For me, this was not an issue because I leave the light on for him during the evening. In all, I have used my YawCam setup for a few weeks and continue to use it. The streaming isn’t full HD, but because I already owned a laptop and owned a spare webcam, this YawCam experiment cost me nothing. 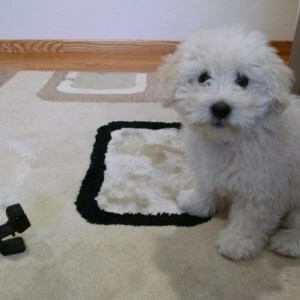 In the end, YawCam was the best solution for my puppy webcam.